We are talking paper thin. The kind of dough that you lift and suddenly you have a gaping hole...kind of like very sheer silk stockings. Carefully ...very carefully you stretch it by running your hands under it. Take off your rings and bracelets to avoid any snags! The Daring Bakers' challenge this month was apple strudel. A strudel is a type of sweet layered pastry with a filling inside and the oldest Strudel recipe is from 1696, a handwritten recipe at the Viennese City Library. One of the challenge requirements was to make the strudel dough. 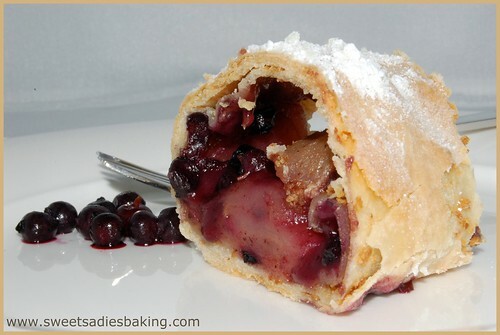 I followed the recipe from our hosts for the strudel dough and made the filling with a combination of apples and blueberries. 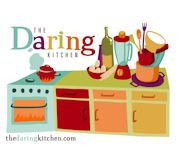 The May Daring Bakers' challenge was hosted by Linda of make life sweeter! and Courtney of Coco Cooks. They chose Apple Strudel from the recipe book Kaffeehaus: Exquisite Desserts from the Classic Cafés of Vienna, Budapest and Prague by Rick Rodgers. I found the dough very easy to work with, although I couldn't get it as large as the recipe required....almost... and very very thin. I could see the pattern in the tablecloth I was rolling it out on! My tasters Dan, Elliot and Meredith decided on the results........and yes...It was a hit! Change to the dough hook. Knead on medium until you get a soft dough ball with a somewhat rough surface. 2. 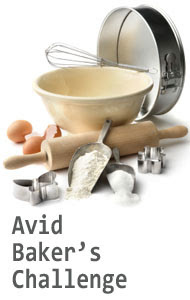 Take the dough out of the mixer and continue kneading by hand on an unfloured work surface. Knead for about 2 minutes. Pick up the dough and throw it down hard onto your working surface a few times. Shape the dough into a ball and transfer it to an oiled bowl. Spray some oil on the top of the dough ball lightly. Cover the ball tightly with plastic wrap. Allow to stand for 30-90 minutes (longer is better). 3. Preheat the oven to 400°F (200°C). Place the rack in the upper third of the oven and line a large baking sheet with parchment paper. Pick the dough up by holding it by an edge. This way the weight of the dough and gravity can help stretching it as it hangs. Use the back of your hands to gently stretch and pull the dough. You can use your forearms to support it. 4. When the dough becomes too large to hold, place it on your work surface. Leave the thicker edge of the dough hanging over the edge of the table. Move your hands underneath the dough and stretch and pull the dough thinner using the backs of your hands. Stretch and pull the dough until it's about 2 feet (60 cm) wide and 3 feet (90 cm) long. It will be tissue-thin by this time. Cut away the thick dough around the edges with scissors. The dough is now ready to be filled. 6. Place the filling along the short edge of the dough about 1.5 inches from the edge. Fold the short end of the dough onto the filling by lifting the tablecloth at the short end of the dough so that the strudel rolls onto itself. Keep rolling it like a jelly roll. Transfer the strudel to the prepared baking sheet by lifting it. Curve it into a horseshoe to fit the pan. Tuck the ends under the strudel. Brush the top with the remaining melted butter, then sprinkle with the cracker crumbs. 7. Bake the strudel for about 30 minutes or until it is deep golden brown. Cool for at least 30 minutes before slicing. Sprinkle powdered sugar over it. Cut using a serrated knife and serve either warm or at room temperature. It is best on the day it is baked. This was fun to make and really didn't take that long. You can check out the other Daring Bakers strudels for more variations! Hello, I am working on a post about the beehive cake pan by Nordicware and googled and ran across your Mom's honey cake recipe and directions for the beehive cake mold. May I put a link in my post so that people can click on your blog and recipe? Thanks for your consideration. Yes I would love you to add the link. Sorry about the delayed reply...I have been travelling a bit - in St. John's Newfoundland right now.